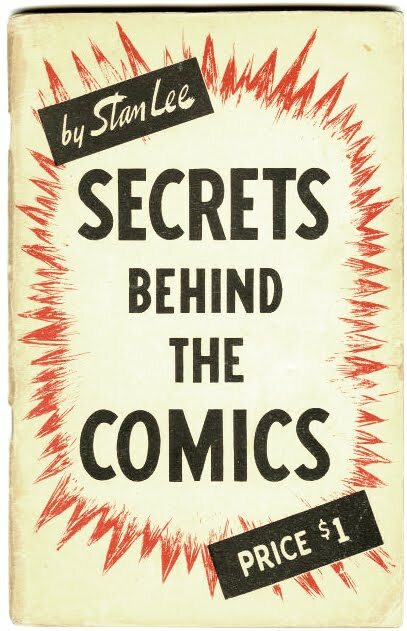 One of the books that I've heard about for years, but never actually had a chance to read in full is Stan Lee's Secrets Behind the Comics from 1947. 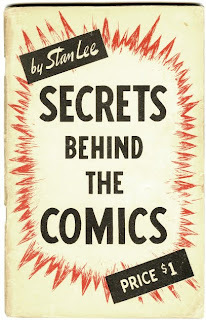 It's a 100-page book in which Lee explains (in his typical hyperbolic style) how comics are made with lots of spot illustrations by Ken Bald. It's sometimes credited as the first book of its kind. It shows up on auction sites every so often, so it's not impossible to find, but it's not exactly cheap when it does come up. The one on eBay right now has an asking price of $200. Marvel actually did reprint it as a limited edition retailer incentive back in the 1990s, but even those go for around $100. From the handful of pages I've seen (bits are occasionally reprinted in Alter Ego) it looks like a neat book, and one in which I think a number of people would be interested in seeing in a more accessible form. And so I thought, "Hey! If I could get my hands on one half-decent copy, I could scan all the pages in and reprint it myself. Since it was first published in 1947, I bet it's lapsed into public domain!" So I started trying to sort through U.S. copyright laws. After a little digging, I find that anything published after 1922 but before 1950 needed to have its copyright actively renewed within 28 years of its original publication or it falls into public domain. 1947 + 28 = 1975. Clearly well before the 1994 reprint, and I can't imagine Lee would've thought to renew the copyright on such a small and, at the time, almost wholly unrecognized book. His memory is notoriously lousy, after all. Now, I had seen/heard rumors of a reprint version sometime in the 1970s. But some people had suggested it was an illegal version, and I couldn't pinpoint when it was actually published either. If it had been published after '75, it wouldn't matter who published it. If it had been published before by someone other than Lee, it would've been technically illegal, but it wouldn't have impacted the copyright. If it had been published before '75 by Lee, that would have constituted a copyright renewal and it would be off limits. That was where my thought process left off as I went to bed last night. I was excited at the prospect of maybe being able to bring some bit of comics history back into print. This morning, I thought, "OK, I was having trouble trying to track down info on this supposedly illegal version. If it was illegal, then it wouldn't have an impact on what I might do. I can probably proceed with plans to get a copy and start putting it together as a new print-on-demand book. You know, though... just to be safe, let me absolutely verify that it's lapsed into public domain." Amazing. Lee managed to renew the copyright on the book the month before it lapsed! One month! Which means, going back to some copyright research, Secrets Behind the Comics will not fall into public domain until the year 2042. It's off limits until then. Now, I have to admit a LOT of surprise when it comes to the amount of obscure comics material that has been reprinted the past several years, but until/unless Lee decides it's okay to print up another version, the book will elusive to the vast majority of comics fans. Even the ones who really want to read a copy! Say, anyone want to put a bug in Lee's ear about reprinting this puppy? I'm betting a print-on-demand version would be quite easy and profitable!